Americans love their cars. Have done since the first Model T Ford rolled off the production line back in 1908. By the mid-20s, more than 20 million were registered in the US. But it wasn’t until after the Great Depression and World War 2 that the golden age of the US automobile was born. A powerful symbol of the nation’s post-war freedom and renewed confidence, cars became ever-more flamboyant, powerful and glamorous. Iconic brands such as Cadillac, Chevrolet, Mercury, Lincoln and Buik designed some of the most recognisable and evocative cars ever made, stirring the passions of kids and inspiring the dreams of motorheads across the nation. Learning to drive became an essential rite of passage for teenagers, a prelude to a youth spent cruising the streets and, for many, customising and modding cars for decades to come. Driving had become the ultimate expression of freedom, individuality and personal empowerment. We hear this a lot at RethinkX. Or rather the distilled version – that people are simply too attached to their cars to give them up in favour of an autonomous, ride-hailing service. It’s the aspect of our research that people seem to struggle with the most. But are people anything like as attached as some seem to think? Is the allure of driving as powerful as it once was? A raft of recent research suggests not. 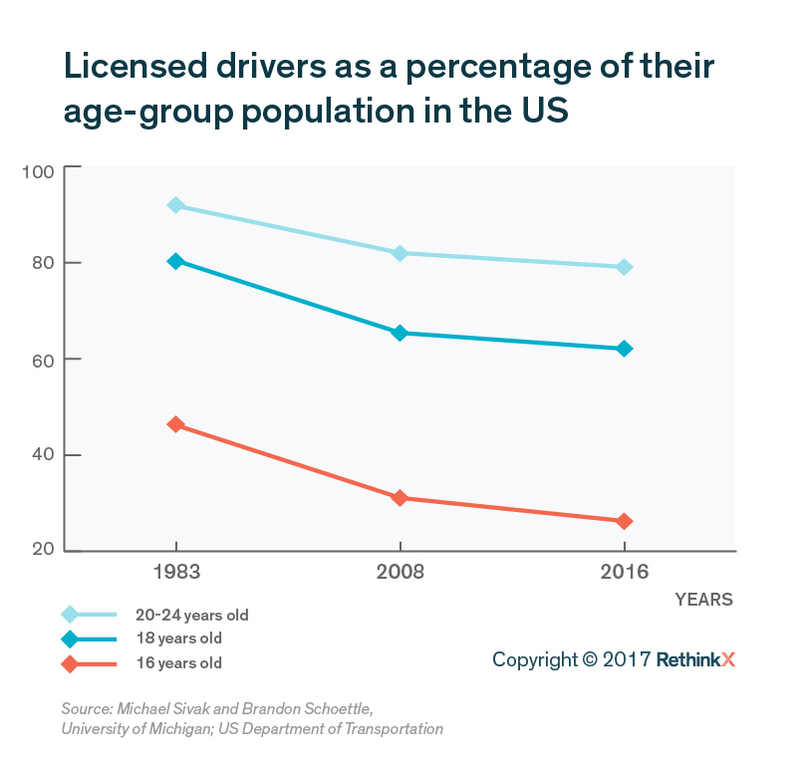 In 1983, almost half of 16 year-olds in the US had a driver’s licence. In 2016, little more than a quarter did. Similar declines can be seen among other young age groups (see chart below), despite a slight uptick in the last year. And there’s no evidence to suggest people are just delaying their driving test. In the UK, research commissioned by the government has shown that in 1992-94, 48% of 17-20 year-olds held a licence (you cannot drive in the UK till you’re 17). By 2014, the figure had fallen to 29%, a huge drop in just 20 years. The equivalent figures for 21-29 year-olds are 75% down to 63%. Indeed separate government figures show that 386,000 driving tests were taken by 17 year-olds between April 2007 and March 2008. By 2016-17, the number had fallen by a quarter to just 295,000. For 18 year-olds, the number was down 10%. Other studies have shown similarly declining rates in Australia, Norway and Sweden, with more modest falls in Japan and Germany. The causes of the decline are numerous. The US study was preceded by a survey from the same team of academics. The top three reasons given for not driving were “too busy or not enough time to get a licence”, “owning and maintaining a vehicle is too expensive”, and “able to get transport from others”. In other words, driving is no longer a priority for younger people, particularly as alternatives are increasingly available. Indeed the survey found that 22% of respondents had no intention of ever getting a licence. There are many more specific reasons why this should be the case. Young adults are spending far more on renting than previous generations, leaving less cash to buy a car, while urbanization has increased both the cost of car ownership and access to on-demand alternatives. Other reasons may be harder to quantify, but include increased participation in higher education, the growing popularity of working from home and increasing environmental awareness. We believe the reason people will happily give up their cars and move to what we call transport-as-a-service (TaaS) – effectively an Uber-style, robo-taxi – is economics. TaaS will cost about 15 cents a mile, compared with 80 cents for buying a new gasoline car or 38 cents for one you already own. In other words, less than half what it costs to keep your existing car running. When you consider that more than half of Americans have less then $1,000 in the bank, saving $5,600 a year – which is what this differential per mile equates to for the average US family – is pretty compelling. But as the growing body of recent evidence suggests, the resistance to this move will not be as strong as some think. In fact the move away from car ownership may have started already – almost 10% of Americans who sold their cars last year didn’t buy a new one. As hard as it may be to accept for those who hark back to a more innocent age – the golden age for the American automobile – younger people today just aren’t that into cars. RethinkX believes that within 10 years of widespread approval of autonomous vehicles, the vast majority of the population will give up individual ownership of vehicles for transportation as a service, provided by on-demand electric autonomous vehicles owned and operated by fleets. This is a very valid point and requires an understanding of how many of the 250m vehicles in the fleet are currently on the road at any one time, the buffer required to meet this demand and the ability to smooth that demand through demand management. The question largely springs from misconceptions about the spread of vehicle trips throughout the day. Commutes are only 18% of total trips (including other forms of transport) or 28% of total vehicle miles traveled, which is a surprisingly low figure. Personal trips by car including errands make up a far greater proportion of total trips (29%). Journeys are far more spread out through the day than generally realized. The graph below from the U.S. Department of Transportation shows the spread of trips by hour during the day and is the best approximation we have found for vehicles in operation at the same time. It feels like there are far more cars on the road during peak hours than at other times because during peak commute times vehicles are generally going in the same direction – from residential to commercial areas and vice versa. Most of the traffic is moving in the same direction, whereas at other times a day there is a more even 2-way flow. But despite the smaller-than-expected number trips occurring at peak hours, this is a genuine concern, with a few options for mitigation. Surge pricing (as Uber calls it) can help to smooth peak hour demand. Raising prices in periods of peak demand can help to alleviate pressure on the fleet and spread out demand. It can also help drive users from the single user TaaS model to the TaaS Pool model. Research by Uber about the price elasticity of demand in surge pricing shows that demand is highly responsive to price increases. This doesn’t have to have the effect of raising average prices of TaaS – in a competitive market these increased revenues during peak hours will be largely passed onto consumers in the form of lower prices in off-peak times. 2. Ability to work while commuting. Some aspects of jobs that can be done during commutes will allow people to travel at non-peak times. Many jobs by the 2020s will have elements that can be done remotely. Freed from the need to drive, people can be more flexible about when they commute to and from their place of work, hence the ability to travel when demand is lower and travel speeds faster, which can allow demand based pricing to have a greater impact on smoothing periods of peak demand. We think in terms of seat capacity not vehicle capacity. The TaaS fleet will likely eventually blend with bus fleets, with vehicles ranging in size from 4-seaters through to 40+ seats. Within the TaaS Pool model there will be the ability to increase vehicle occupancy to soak up demand during peak periods. Our model sees an increase in passengers per vehicle as TaaS Pool plays an increasingly important role in mobility, meaning fewer vehicles are required to service the same number of passenger miles. New communications technologies such as VR may allow an increase in remote working or socializing, which could contribute to a reduction in peak hour congestion. As autonomous vehicle share increases, parking spaces and other land in cities will be available for other uses. It is possible that as cities become more liveable that walking or cycling increases and the distribution of residential areas shifts. Our model sees passenger miles increasing by 50% by 2030 with vehicle miles remaining nearly constant (due to increasing TaaS Pool use). Much of the increase in passenger miles comes from people currently excluded from private vehicle transport (the elderly, disabled and those on lower incomes). This demand is likely to be more price sensitive and lead to greater increases in TaaS Pool demand. Furthermore, demand-based pricing during peak hours might lead to movement from TaaS to TaaS Pool, increasing passengers per vehicle and seat occupancy. A study from the ITF shows that a fully autonomous fleet could meet demand at all times with only 3% of the vehicle fleet in Lisbon, Portugal. Our model sees just over 11% - a more conservative figure. Part of this difference is because the ITF sees vehicle miles dropping by 37% as passengers per vehicle rise (due to an increase in ride-sharing – TaaS Pool). Lisbon is also denser than most American cities, meaning fewer redundant trips. Other differences that explain the difference are because we allow for lower utilization. There is a growing body of academic research (for example here and here) that has modeled the potential reduction in vehicle numbers due to TaaS, with figures largely falling between 5 and 11 vehicles taken out of the fleet for every TaaS vehicle. Our model equates to 8.6 to 1 (232m individual vehicles replaced by 26m TaaS vehicles). However these estimate tend not to include any smoothing of peak demand through demand-based pricing, which could increase these figures. Related to this is a discussion of vehicle redundancy – how many unoccupied miles will be covered by TaaS vehicles. This is important because whilst they are repositioning after trips in readiness for the next trip, they are unused, and the miles covered generate no revenue (whilst depleting the vehicle lifetime). Again there is some research suggesting a figure of 3-14%, once AI is used for predictive demand management. This is an area that requires more research and we will look to deepen in future analyses. Our analysis is a scenario, subject to a large number of assumptions. No scenario will ever be completely accurate. There are many aspects that might make our analysis incorrect that stem from unforeseen regulatory responses, through to the ability of technology providers to create monopoly pricing situations (we assume competitive markets). Work and leisure could be disrupted through VR and other communications technologies that affect travel patterns, a low-cost transport platform could disrupt logistics or lead to a huge increase in deliveries of goods by TaaS vehicles, replacing some personal trips but increasing delivery travel, etc. What our analysis ultimately shows is that mainstream analysis needs to consider the potential of a TaaS disruption in more detail and adjust many of their assumptions to reflect those areas where our analysis highlights alternative possibilities. But this is exactly what Tesla is working on. In a 2015 blog post, Elon Musk mentioned that Tesla was designing its powertrain for 1 million miles, and it attracted pretty much no attention from the mainstream cognoscenti. With autonomous vehicles on the cusp of reaching the mainstream, a new business model will be unleashed; transport-as-a-service (TaaS) will render individual car ownership obsolete. This new business model will change how the transportation value chain works and the success factors that drive business decisions. These vehicles will be fleet-owned with users just paying a cost per mile, which will become the key metric for building and running vehicles. We already know that the operating cost of an EV platform is far lower than a gasoline vehicle. Fuel costs are way lower because electric motors are more efficient than combustion engines and electricity is cheaper than gasoline. 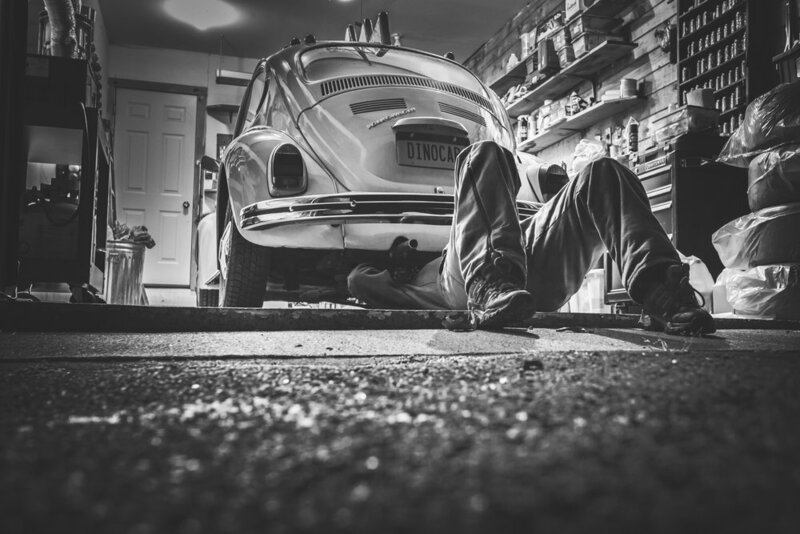 Maintenance costs are way down – just 20 moving parts versus 2,000 means there’s much less to go wrong– and an operating environment that has little heat, friction or vibration – the scourges of gasoline vehicles. But the biggest cost is the depreciation cost – the way vehicle owners recover the upfront cost of the vehicle – and this is where A-EVs have a huge advantage. In an individual ownership model, lifetime of vehicles is irrelevant. So long as the vehicle can do, say, 150k miles, it doesn’t figure in consumer choice. In this model, buyers care about residual value – how much the car will drop in value whilst they own it. This is the basis of lease payments (and depreciation costs) and it is how the consumer calculates the cost of ownership. But in a TaaS world it’s entirely different. TaaS vehicles will be in use most of the time and will drive more than 100,000 miles per year – and they probably won’t change hands. Residual values won’t matter – but lifetime will! Depreciation cost per mile will be based on dividing the upfront cost by the lifetime miles of the vehicle. Upfront cost seems to attract all the attention. EVs currently suffer in comparison because they currently cost more than gasoline vehicles. But this comparison is rooted in the old world of individual ownership. The other part of the calculation – lifetime miles ­is a much more important story. Our research indicates that some EVs today can last at least 500k miles - and that’s before the new business incentives to lower cost per mile, really kick in. A doubling of vehicle lifetime has the same effect on depreciation cost per mile as halving upfront cost. If vehicle lifetime increases from what seems to be the current mainstream assumption of 140-200k miles to 1 million miles, then it decreases depreciation cost per mile by 5-7x. And this is possible. That’s why the focus on upfront cost in EVs is missing the point. Cars aren’t optimised for lifetime yet – why would they be? In private ownership 12 years is plenty. But change the business model to TaaS, and 1 million miles makes perfect sense. In fact, a million-mile car will soon be a minimum business imperative! One that Tesla gets but conventional car companies seem to be missing. In 1927, Charles Lindbergh famously flew across the Atlantic, landing at Le Bourget field outside of Paris. Three years later, France started building a wall, the Maginot Line - a massive series of fortifications along its borders with Germany that became the centerpiece of its defense strategy. A younger modernist generation, who had seen the evidence of the value of the airplane, favored investment in armor and aircraft, but this thinking was seen as disruptive and was defeated by the insiders and policymakers trained in 19th-century military strategy who still ran France’s military. The result: it took just six weeks for the German military to make it to Paris. The Nazis went easily around and over the ‘impenetrable’ Maginot Line. The Luftwaffe deployed more than 5,000 combat aircraft to support this invasion. Policymakers, insiders and experts who thought that the future was just a linear, incremental extension of the past, dismissed evidence of a technology disruption (aviation) and made choices for the future based on mainstream notions from the past - with massive implications for Europe and the world for generations to come. In 1865 the United Kingdom Parliament passed the Locomotive Act, which required that “self-propelled vehicles”, which included automobiles, employ a crew of three people: two onboard and a man with a red flag who had to walk at least 60 yards (55 m) ahead of the vehicle. The speed limit of these vehicles was set at 4 mph in the country and 2 mph in the cities. This regulation, known as the “Red Flag Act”, was the result of successful lobbying by the unlikely coalition of the locomotive industry and the old horse-drawn coach and carriage industry. The government effectively stopped innovation in the incipient automotive industry for 25 years. The Locomotive Act of 1896 repealed many of the provisions of the “Red Flag Act”, finally allowing the development of the automotive industry. But it was too late. The United Kingdom, birthplace of the industrial revolution, did not benefit from one of the biggest spinoffs of that revolution: the automobile. The United States, then an emerging economy, went on to become the 20th Century’s economic and military superpower based in part on the strength of its auto industry. By the 1950s, the U.S. auto industry produced more vehicles than the rest of the world combined. In 1960, automotive was America’s largest industry, employing directly or indirectly one of every six working Americans. During World War II, Ford alone built 6,790 B24 Bombers, 282,354 Jeeps and 42,676 Army/Navy Cargo Trucks. By preventing innovation and the benefits of technology disruptions, policy makers in France and the United Kingdom only ensured that the upside of building new industries would accrue to other countries, while denying and postponing the inevitable costs of the disruptions. These lessons are as important today as they were then. The founders of RethinkX met at a military think tank meeting to discuss the potential geo-political implications of the disruption of energy and transportation. There, top “mainstream” analysts discussed the linear, incremental progress that solar, batteries and electric vehicles were making and how “the transition” would take decades. Technology disruptions are not linear progressions. They are dynamic and systemic. They may take a while to build up but when they reach a tipping point, they move in exponential S curves and trigger feedback loops – both positive and negative. Yet mainstream analysts kept making the same mistakes in providing an incomplete picture to policy makers and decision makers that led the French and British policy makers to fail to anticipate the implication of technology disruptions. And failure to foresee disruption leads to decisions based on flawed scenarios, which can become self-fulfilling prophesies, locking society into a high-cost, uncompetitive future. Our conversation moved from transportation and energy to food, health care, finance, housing, and education. We agreed that these sectors were on the cusp of being disrupted but there was no one providing a full picture of how these disruptions were going to evolve, their implications, and the choices that society would have to make going forward. Several hours into our conversation, we had laid out the conceptual underpinnings of what would become RethinkX. There are some hugely beneficial aspects of disruption, including lower costs and broader availability of goods and services, from transport to energy to healthcare to food. This could help solve some of the world’s largest problems, including poverty, inequality and climate change. But there are also adverse consequences that need to be acknowledged and mitigated. These include job losses and changing workforce needs, as well as value destruction for pensions and investment funds that don’t adapt in time. RethinkX is an independent think tank that analyzes and forecasts the speed and scale of technology-driven disruption and its implications across society. We produce compelling, impartial data-driven analyses that identify pivotal choices to be made by investors, businesses, policymakers, and civic leaders. Rethinking Transportation is the first in a series that analyzes the impacts of technology-driven disruption, sector by sector, across the economy. RethinkX’s follow-on analyses will consider the cascading and interdependent effects of disruption within and across sectors. Our aim is to facilitate a global conversation about the threats and opportunities of technology-driven disruption and to focus attention on choices that can help lead to a more equitable, healthy, resilient and stable society. We invite you to be part our community of thought leaders and experts to better inform this conversation.